This small town in Southern Tunisia is famed for its distinctive and awe-inspiring subterranean dwellings. The troglodytes have been created by digging a deep hole in the ground to create an open-top courtyard and then digging artificial caves around the perimeter of the hole to create rooms. The history of the buildings is shrouded in mystery, but a popular myth suggests that monsters would reside below the ground and emerge from beneath to attack land usurpers. These settlements were totally unheard of until 1967 when, after 22 days of torrential rain, a Matmata resident visited a nearby village to seek help when their troglodytes collapsed. Aid was provided and settlements were built on the surface of the land, however, to this day many locals still choose to live in their re-constructed cave homes. Today the town is a thriving tourist hub, attracting bus loads of eager visitors who wish to bear witness to its unique selling points. Occasionally, tourists will be permitted into local troglodyte homes and invited to acquire an authentic experience of Tunisian family life. Matmata famously caught the attention of George Lucas, who was perhaps encouraged by the other wordly landscape and the unfamiliar appearance of the buildings to use Matmata as a filming location in 1976 for Star Wars Episode IV: A New Hope and again in 2002 for Star Wars Episode II: Attack of the Clones. 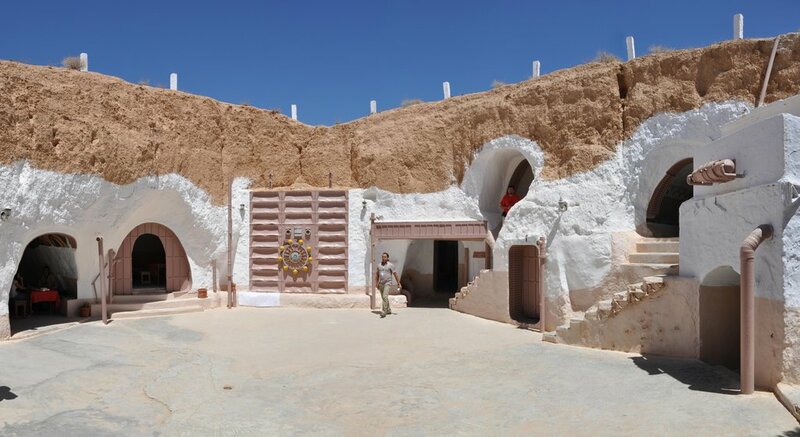 The Hotel Sidi Driss in Matmata features in the film as the home of Luke Skywalker and his Aunt Beru Lars and Uncle Owen Lars on the planet Tatooine. The film decorations are still on display in the hotel, which is open to film fanatics all year round. When guests are finished roaming the labyrinthine corridors of the Sidi Driss Hotel, it is worth checking out the small museum to the rear which showcases information on local history.